•	Easy to clean and disinfect. 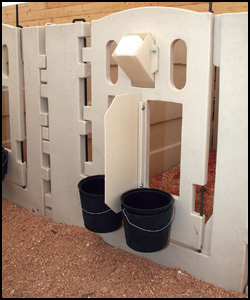 •	Available with doors to accommodate either 5 quart or 10 quart buckets and bucket holders, with a feed/water divider to help keep feed fresh. •	Free standing; does not require post. •	Capable of being set up side by side and back to back; can be added to any time. •	Available with either a solid back panel or with ventilation holes. •	Made from food grade, UV inhibited polyethylene.